In 1810, the first settler to arrive in the Berwick area was Benjamin Condon. The crossroads of present day Main Street and Commercial Street became known as Condon’s Corner. The settlers that followed in the ensuing years were mainly United Empire Loyalists and many of their descendants are still living in the Town. From its early beginning until the 1850s, the Town had other names such as Pleasant Valley, Currey’s Corner and Davison’s Corner. In the 1850s, a Temperance Hall was opened and at a meeting of the local residents held there, the name Berwick was chosen. The commercial community of that time was primarily situated on Main Street and included among others a blacksmith shop, tin shop, two general stores, a shoemaker and a carriage factory. In 1856, the stage coach from Annapolis to Halifax began and in 1867 the Windsor to Annapolis railway was opened, thereby creating better transportation links for the Town. Being in a primarily agricultural area, the community flourished over the years as the agricultural industry grew. The agricultural service industries that developed created a viable village. Several notable achievements of our past can be attributed to the Berwick Fruit Company. This organization operated the first fruit warehouse in Nova Scotia that ventured into cooperative packing, an event which occurred in 1907. In 1923, the Berwick Fruit Company opened what was then the most modern and largest warehouse in the Maritimes. Berwick had become one of the leading agricultural-based industrial centres in Nova Scotia. There was a large meat processing plant, a vegetable and fruit processing plant, and a large bakery in the Town. At their height, they employed approximately 425 people depending on the time of year. Although the agricultural industry in Berwick has slowed, the Town is very proud to be the home of Eden Valley Poultry Ltd., a large poultry-processing cooperative. The new company plans to open a state of the art poultry processing facility in mid-2012. In addition to various agricultural ventures in the area, a number of residents are employed at the Michelin Tire Plant, Canadian Forces Base Greenwood and local social, educational and health institutions. The backbone of the community remains the small businesses which, in many cases, have served Berwick and the surrounding area for a number of years. The population of Berwick has grown slowly but steadily the past half-century. In July of 1923, Berwick was incorporated as a Town and in 1931, the population was 837. The population at the time of the most recent census, (2006) was 2,454 and Berwick was noted as the fastest-growing town in Nova Scotia. There has been a steady population growth in the past and it is expected to continue as the Town strives towards a prosperous and sustainable future. The crown above the shield depicts maple leaves for Canada and trailing arbutus (mayflowers) for Nova Scotia. The bear is taken from the arms of the Town's namesaske in England. The smithy is a traditional figure in heraldry to depict industry. Similarly, Ceres, goddess of the harvest, is the figure for agriculture. 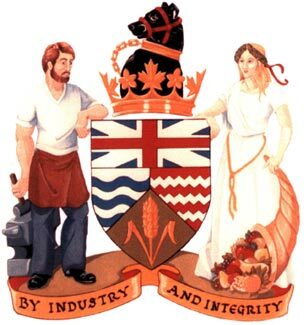 By Industry and Integrity is the motto which roots the town of Berwick to its past, but also guides out present and drives our future.